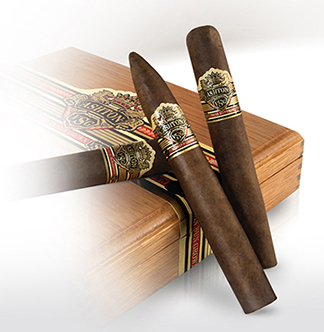 Ashton's VSG cigars are blended exclusively for Ashton by Carlos Fuente Jr. using 4- to 5-year-old aged Dominican tobacco taken from the finest and most fertile plants. The distinct flavor of the handmade VSG cigar comes from its proprietary wrapper, which is grown on a private estate in Ecuador owned by the Oliva family. The leaf is taken from the higher primings and matures slowly by sunlight filtered through the region's natural cloud covering, resulting in a rich, intoxicating wrapper. Ashton's VSG cigar is a full-flavored, ultra smooth, complex cigar that consistently receives high marks by industry professionals and cigar aficionados alike.